Escape Room: Apartment 7 Level 1-16 Walkthrough, Solutions, Cheats, Answers for iPhone, iPad, Android, Kindle, iPod Touch and other devices by Weiwei Huang. Escape Room: Apartment 7! One of the most popular escape game in iTunes! Escape Room: Apartment 7 Level 1 Walkthrough, Solutions, Cheats, Answers for iPhone, iPad, Android, Kindle, iPod Touch and other device by Weiwei Huang. To open the left cabinet, look at the thermometer on the right wall. F=86 and C=30, so the code is 8630. 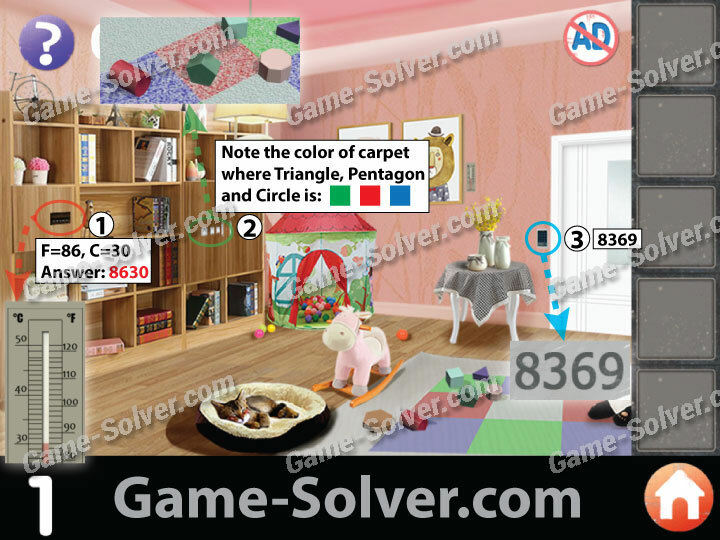 To open the right cabinet, look at the carpet and note the color of box where the Triangle, Pentagon, and Circle is in: Green, Red, Blue. Open the door for exit with code 8369.